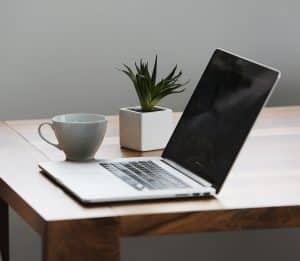 Home › Investing › Is TD Ameritrade The Best Online Stock Broker? Is TD Ameritrade The Best Online Stock Broker? If you could conjure up all the ingredients that create the best online stock broker and put them together seamlessly, TD Ameritrade might be where you would end up. TD Ameritrade stands toe-to-toe with industry heavyweights like Schwab and Fidelity for the range of services it provides yet competes aggressively on price with discount online brokerage firms. In many ways, TD Ameritrade is the best of both worlds. If you want a speciality options trading platform, thinkorswim – which is owned by TD Ameritrade – is the place to go. Want to trade forex, futures, or simply stocks? You got it! Mutual funds and bonds are no problem either. TD Ameritrade has got you covered. The range of tools, analyzers, chart studies and simulators is almost mind-boggling. Yet TD Ameritrade shines on cost too. Unlike some other platforms that nickle and dime you on hidden fees, TD Ameritrade makes every efforts to keep fees low, highly competitive and fully transparent. For its combination of tools, research, ease-of-use, low cost, transparency, and customer support, TD Ameritrade earns the title of best online stock broker. Commissions as low as $6.95 are available to stock traders while options traders pay $6.95 + $0.75 per contract. Across the board, commissions and fees are low at TD Ameritrade, whether you are trading equities, fixed income products, futures, forex or anything in between. The maximum leverage available to forex currency traders is 50:1 on all major currency pairs. On exotic pairs, the maximum leverage permitted is 20:1. If risk levels fall below 100% by 4am EDT or intraday below 25%, TD Ameritrade will liquidate positions. 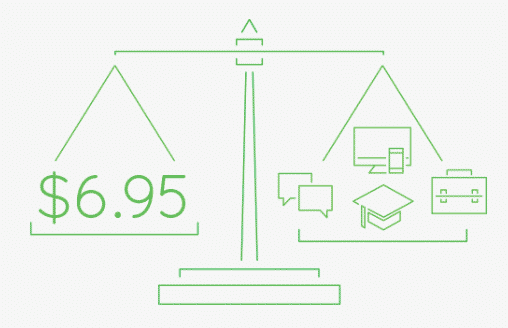 Beyond low fees, TD Ameritrade shines when it comes to value for money. In fact, it offers so much value that it doesn’t charge a penny for services that are billed elsewhere. TD Ameritrade clients enjoy access to its powerful thinkorswim platform featuring more chart studies than any other platform, a proprietary study called Fast Beta to spot securities breaking out of trends, extensive screening and scanning tools and even an embedded programming language for adventurous traders who wish to manipulate chart studies and technical indicators. As a TD Ameritrade client, you enjoy access to one of the best online trading platforms bar none, thinkorswim. thinkorswim has an extensive range of tools, stock scanners, charts, and technical studies to satisfy even the most experienced trader. The dizzying array of customizable tools may feel overwhelming to beginners but stick around and you will be rewarded by professional grade analytical tools without taking a dime out of your pocket. thinkorswim provides more technical studies than any other platform. Over 300 studies are available on feature-rich charts. So, whether you use standard chart studies, such as simple moving averages, RSI, MACD, ADX or On-Balance Volume indicators, or you prefer more exotic analytical studies, such as Chandelier Exits, Ichimoku Clouds, or Pivot Points, you will have the analytic capability you need at your fingertips. 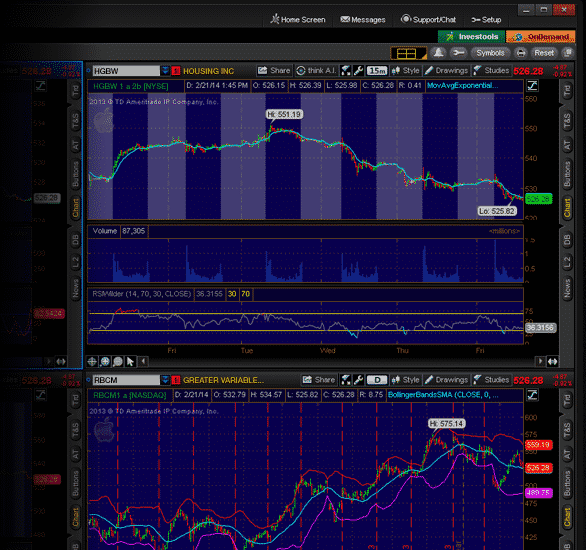 Fast Beta is a trademarked service at thinkorswim that allows you to view the market in a different light. Recent price data is weighted more heavily so this proprietary TD Ameritrade chart study helps you to analyze securities that are breaking out of current trends or are more volatile. If you want to find new stocks and options easily, thinkorswim has powerful scanners and screeners that let you filter out securities. Where thinkorswim leaves most online trading platforms in the dust is its innovative technology solutions to satisfy almost any trading need. With thinkScript, traders can manipulate existing charts and studies using an embedded programming language. Want to create a technical chart study and name it after yourself like McClellan did with the McClellan Oscillator or Bollinger did with the Bollinger Bands, now you can! Covered call traders may feel like they stumbled on a virtual trading nirvana when exploring Strategy Roller. Any long-term stock positions you wish to hold while also selling short call options to generate additional income are candidates for Strategy Roller. Strategy Roller automates the process of rolling forward call options on stocks you want to hold – otherwise risk of assignment exists if short calls go in-the-money, which happens when share prices rise above strike prices. Have you ever wanted to be long and short the market at once? With pairs trading you can be. You can buy one position and short another simultaneously as part of a pairs transaction. Extensive 3rd party research is available on the thinkorswim platform, so you can do your homework on stocks before pulling the trigger. And when you’ve picked a company that meets your criteria, you can use tools to predict how share prices will be affected by revenue figures, among other powerful capabilities. TD Ameritrade caters to standard, retirement, education, and specialty accounts plus offers a robo-advisor automated managed service via Essential Portfolios. As you might expect from a broker that has been around for a long time, TD Ameritrade caters to just about every account type imaginable. No account minimum is imposed to get started but obviously it makes sense to contribute a decent chunk of change so you can afford to trade. After all, just one share of some well-known stocks can cost as much as $1,000 alone! TD Ameritrade features over 100 commission-free ETFs, a world class mobile platform, and ongoing tutorials. Here are some other noteworthy fun facts about TD Ameritrade before you get started. TD Ameritrade has over 100 commission-free ETFs in its lineup, so whether you want exposure to emerging markets or simply the healthcare sector, you will find what you need. Many have low expense ratios too, so you can enjoy the benefit of paying no commissions and low ongoing costs. If you trade on-the-go, you will not feel limited when using the thinkorswim mobile app, which is available both on iOS for Apple users and Android. You can view charts and news, place trades and even fund your account via the mobile app. Swim tutorials mean something else at TD Ameritrade. On its thinkorswim platform, you can attend daily Swim Lessons, which are full of helpful advice on a wide variety of topics. With its dizzying area of powerful tools, analysis software, screeners, scanners, and chart studies, TD Ameritrade stands above its peers when it comes to innovative technology and earns the top spot as the best online stock broker. Despite its extensive software capabilities, fees and commissions are highly competitive compared to its rivals. Plus, you get a ton of features free, including real-time data, scanning tools and third party research reports. Experienced traders will find TD Ameritrade’s thinkorswim trading platform as close as it gets to trading platform nirvana while beginners will need to be patient at first because it can feel overwhelming with so much analytical power at your fingertips.